One may have become accustomed to abundance from Satoko Fujii. But how she is able, in this, her 60th year, to maintain the uncommonly high degree of creativity, while remaining so prolific, will remain an enduring mystery. One can only assume that there is something in her that suggests that points to the fact she may be made completely of music – genetically and artistically as well. Think about that for a moment. Miss Fujii is one of those musicians whose artistry feels as if it is prescient. She does not seem to make – or create – music and the sounds that you hear appear to flow from her fingers rather than from the instruments she plays. Moreover, like most players who play “in the moment” the experience is almost never the same if another pianist – or a group of musicians including one conducted by her – is charged with interpreting her music. Although this is a rare occurrence, one of the albums that makes its way into the oeuvre relating to Miss Fujii’s 60th year “celebrations” does indeed comprise music not performed by Miss Fujii, but, instead by a piano-playing compatriot, Yuko Yamaoka. More about this later. The presence of Natsuki Tamura, her trumpet-playing husband is also a boon-companion to much of the music that Miss Fujii creates. Not only do they think as one, but Mr Tamura also instinctually picks up on where the music must go – and he takes it there before bringing it back to where it becomes awash in Miss Fujii’s creativity once again. Also, although there is great breadth in the music of these four albums with which Miss Fujii closes out 2018; and she seems to have forged relationships with musicians who may (or may not) have played with her in the recent past. This has its obvious rewards, not the least of which is a fresh perspective on the music of a musician who is completely unrestrained – is such a thing is possible – by the limitless boundaries of purely improvised music. 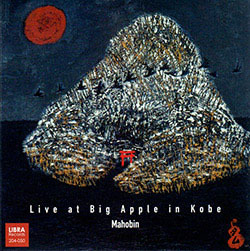 Mahobin: Live at Big Apple Miss Fujii’s music is often rich in symbolism and mysticism. It isn’t obviously stated, but almost always nestles just below the surface of her melodic and harmonic conceptualisation. It’s what enriches the experience of her music; and what makes her something of a musical samurai. Mahobin literally means “magic jar”. Despite the dreamy connotations this music nestles in the deeply concrete recesses of Miss Fujii’s music. Still it is possible to enjoy the music in the state that “it is imagined to be” as well as in the state of things (notes) as they really are”. The effect of “Rainbow Elephant” enables one to be transported thus, into the realm of “the ancestors”. In the dreamy nature of its performance, where Miss Fujii’s spare pianism is egged on by Mr Tamura’s trumpet punctuations and those of Lotte Anker’s bleating and the ethereal electronics by Ikue Mori, we are ushered upon the proverbial bridge to heaven eventually to be swathed in the courageous sacrifice made by elders behind the “Yellow Sky”. 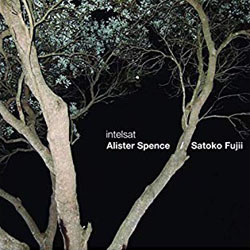 Satoko Fujii | Alister Spence: intelsat Although the name of this disc gives the impression of it being an interstellar one – and rightfully so as it’s charts are designed to convey the perceived nature of Saturn’s seven moons – sonically one cannot escape the pervasive spiritual aura that Miss Fujii brings to any repertoire in which creation she participates. The often isorhythmic nature of these charts comes from the interweaving of Miss Fujii’s piano with Alister Spence’s other keyboards and effects. Their exchanges make for a multitude of rich and complex textures, and it is this richness of sonority that makes this album stand out among almost all of the others that Miss Fujii has recorded during this past year. The ghostly suggestion of voices in this spatial music mimics the perfect intonation of a multitudinous choir of acolytes. 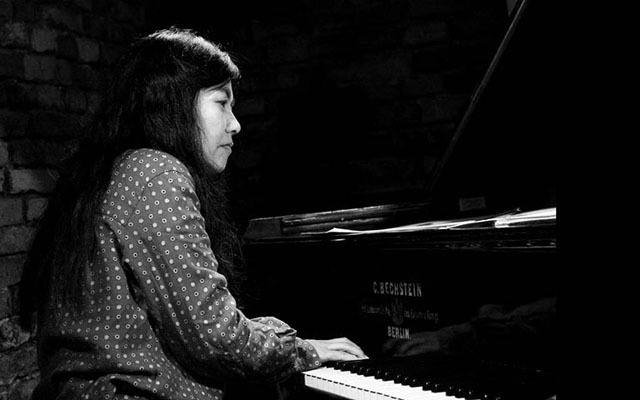 The seemingly meticulous nature of the interaction between Miss Fujii and Mr Spence also brings the rhythmic suppleness of each of their instruments to the fore and it is possible to lose oneself from the brevity of Mr Spence’s punctuation on “Narvi” and the leaping, runs and forays of multitudinous notes towards the solemnity and purity of this sonic experience. 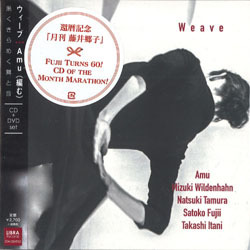 Amu: Weave It was probably only a matter of time before the music of Satoko Fujii could be interpreted in the form of dance. But it appears to have taken the rare dance interpretation of Mizuki Wildenhahn to bring this to fruition. It is not as if no one else could have brought Miss Fujii’s music into the realm of dance. As a matter of fact her own performances often feel as if they come from pulsations imbued by her own body before these sound waves make it to the nerve endings of the pianist’s own body from there to emerge in all their elegant and visceral splendour onto the keyboard. But Weave is special because its beauty unfolds through Miss Wildenhahn’s interpretations as she combines the fluid eloquence of classical ballet with the raw and spirited energy of flamenco in a potent mix of aerial balletic pirouettes and a kind of terrestrial contortion of the soul en route to the magical mesmerism and soulful channeling of duende. This is a very special experience that is shared on DVD for the first time in Miss Fujii’s long and distinguished career and the experience is a molten mix of ethereal beauty and primeval energy. The airy manipulations of Mr Tamura’s lips on his trumpet mouthpiece and Takashi Itani’s sticks on his sizzling cymbals and battery of percussion instruments make for magical interpretations of “Gorondari” and “Hajori”. Exquisite cinematography and rhythmic dissolves are unique features in the DVD component of this package. But as ever the CD is also quite a magical experience as well. 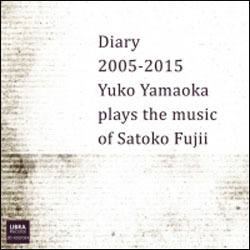 Satoko Fujii | Yuko Yamaoka: Diary 2005-2015 – Yuko Yamaoka Plays The Music Of Satoko Fujii This is perhaps one of the most monumental recordings of music in the Satoko Fujii canon. It has a total of 118 compositions most of which are highly emotionally-charged miniatures. Miss Fujii describes them as entries in a sort of musical diary and despite the kind of “noh” like masks that often seem to form in Miss Fujii’s music façades seem to peel away like the skin of a great musical onion as Yuko Yamaoka finds the emotional centres of these magical pieces. It music be said that while Miss Fujii does not disguise her emotions intentionally or otherwise she doesn’t exactly wear them on her proverbial sleeve either. Still, this music emerges in the same manner that the German poet once called “the poetry of emotion” for even in the sometimes fragmented nature of Miss Fujii’s phraseology she makes music like sonic Tanka. Thus when lines are added to phrases one imagines the emergence of thoughts and emotions as complete as Japanese Haiku. In this performance, composer and soloist coexist as equals with the one emerging from the other. If anything this intensifies the hypnotic dream-world quality of this work. Miss Yamaoka ends up giving powerful accounts of all 118 compositions on this monumental double disc. Track list – Disk Two – 061109; 062809; 070209; 091209; 091309; 092609; 102309; 102409; 102509; 111609; 031210; 031510; 031810; 032810; 040110; 100610; 101610; 120410; 010211; 120911; 010212; 020112; 030712; 031412; 032012; 042512; 050612; 051612; 061012; 072712; 080512; 080712; 082612; 110312; 110612; 121312; 010613; 011113; 012213; 012913; 032313; 052013; 060913; 102613; 120813; 041514; 041814; 050314; 051614; 072714; 082714; 090414; 111114; 081115; 102315; 031316.